Insert the USB mass storage device into your laptop’s USB port. Your computer should be on and working. You may hear an audible alert, a signal letting you know that Windows has found and detected the device. If a dialog box appears, choose from the list what you want to do with the device. 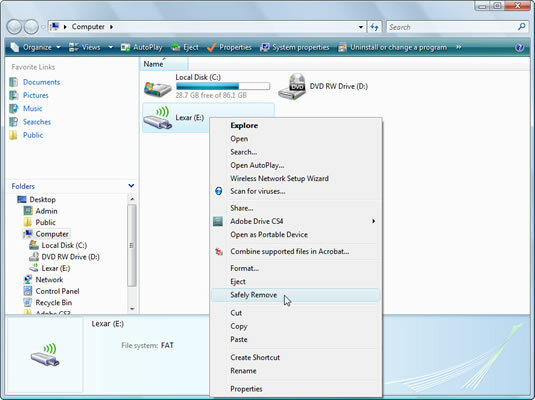 The list, shown here for both Windows Vista and Windows XP, allows you to customize how you view the files on the USB drive, depending on the drive’s contents. Options for reading a freshly inserted USB disk (Vista on the left, XP on the right). 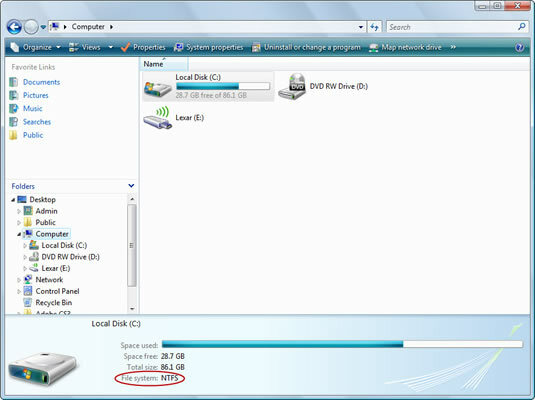 No matter what you choose to do with the removable drive, you can still see it listed along with other disk drives in your computer system. That view comes from the Computer/My Computer window. The below figure shows the removable drive in Windows XP, where it’s labeled Lexar Media and given drive letter E.
You can leave the USB drive attached to your laptop as long as you like. Mass storage means some gadget that can store information just like a hard drive, CD, DVD, or silicon disk (flash memory, memory card, and that ilk). A flash memory card reader can be used to read a Secure Digital or Compact Flash memory card. These cards are used in digital cameras to store images. To transfer the images from your camera to the laptop, you just remove the memory card from the camera and insert it into the laptop’s card reader.